White Chamber – Entertainment Ave! I get so mad at myself when I don’t see the plot twist coming. I also secretly applaud the film folks when they pull it off. And so I must applaud the film folks of “White Chamber” when the big reveal came towards the end of the movie because I just didn’t see it coming. I won’t give this moment away, so let’s get to the story. It appears the United Kingdom is in a civil war. Somehow the military has taken over, led by General Zakarian (Oded Fehr). Enter Ruth (Shauna Macdonald), or whatever the woman’s name is. She wakes up in this white room, a.k.a. chamber, completely lit up, and with a bump on her noggin. As the woman begins to get her wits about her, a disguised voice of the General bellows around her and begins to ask her questions. The good, or maybe bad General, needs some information, and he thinks the woman has it. Me, I just wonder where this woman is going to poop. Now, the white chamber isn’t just this room lit in white, it’s really a torture chamber. Suddenly the General makes the room incredibly hot. The woman isn’t happy. Now the General makes the room deathly cold. The woman still isn’t giving any answers. Hell, acid starts dripping from the ceiling, and the woman still keeps her mouth shut. This is one tough lady. Or she doesn’t know crap. Suddenly this crazy, deformed woman appears in the chamber, our tough lady has to defend herself, things calm down, and it’s time for a flashback, because, hey, we really need to figure out how our heroine ended up in this chamber. Yup, it turns out Ruth isn’t as she seems. She does have a secret, was in charge of the chamber and its torture, and her name isn’t Ruth. And when one of her test subjects brings up no toilet, I had a good laugh. And this is where I am stopping my synopsis as any more will give a lot of the fun away. 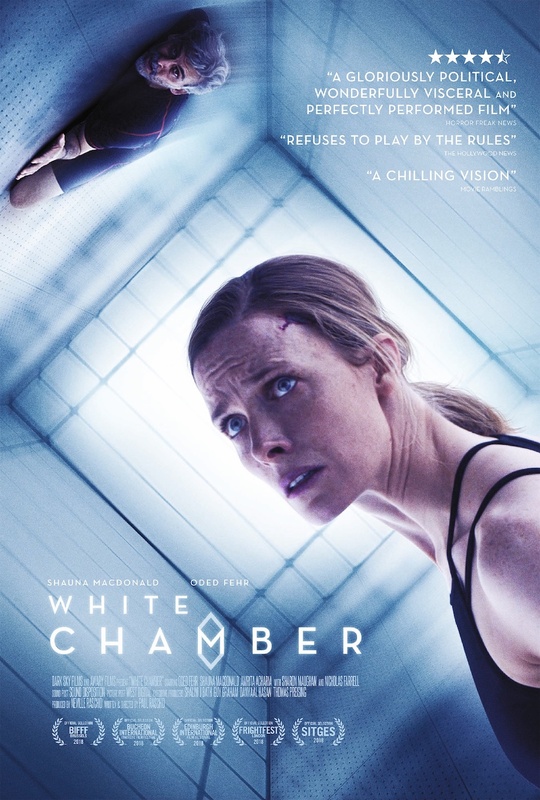 While “White Chamber” isn’t the greatest, it is a good psychological thriller peppered with a fun mix of gruesome. The finger-eating scene is pretty intense, things are put together very well to help the story flow, and I’ll give credit for a movie with just a handful of characters, they all weave their way through making us care about their eventual outcomes.